Graphic and web designers know the problem: projects have to be approved by the client or discussed with the rest of the team. This results in plenty of comments, change requests, and questions. CuePin provides an effective, and easy to use collaboration tool that lets you present your drafts for websites and other projects to other people very easily, while giving them the opportunity to add notes directly to the draft. Working with CuePin is very simple. After registration, set up a new project and upload your drafts. Common image formats such as JPG, PNG, and BMP, as well as PDF documents are supported. Sort your images into different folders, and name them accordingly, creating a clear structure for your project. 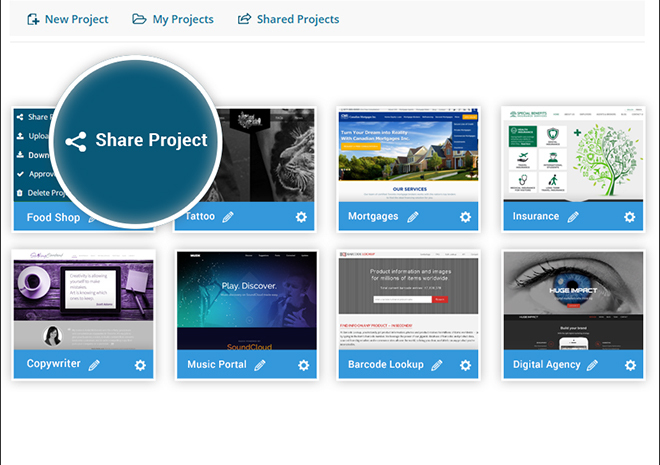 To give customers or team members access to your project, either share it via URL, or send email invitations. If the invited people are not registered at CuePin yet, they will have to sign up first. Afterwards, all participants have the option to actively participate in the project. 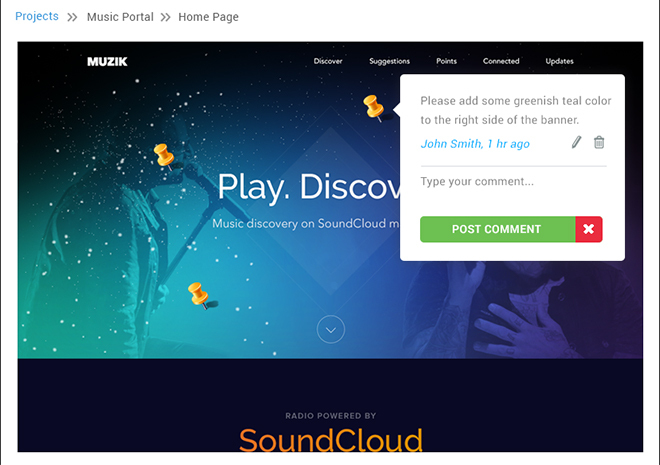 Annotations or comments can be created directly within the draft. To do so, place a pin at any position within a design or document, and enter a comment. This way, it is evident what the annotation is referring to. This saves time and prevents misconceptions and confusion. By the way, the username of the author is displayed for each comment. Thus, you’ll always know who wrote it. Additionally, all comments are displayed in a clear chat history, which can easily be displayed on the right border of the user interface. That’s also where you get to write general comments that don’t refer to a pin within the displayed design or document. The chat also allows for real-time communication with all participants. This makes exchanging ideas very easy. The chat history tells you who wrote a comment at what time. If a comment refers to a pin placed on an image, this will also be displayed. Another of CuePin’s feature is the option to keep a version history of designs and documents. Especially in the outline stage, there will be a lot of refined designs that need to be discussed with the rest of the team. To do so, simply upload the refined image files or PDF documents, and allow the other participants to place annotations. However, previous files are not overwritten. Thanks to the integrated version control, all previous versions are available as well. This makes it easy to trace back how a design or document has evolved. Discarded ideas are not lost, but can be accessed again at any time. In the course of a design process, it’s not uncommon that you’ll realize that a previously discarded idea was not that bad after all. Overall, CuePin impresses with its clear interface, and its simple controls. The amount of new comments is still displayed when you hide the chat history. You’ll also receive information on the amount of new comments via the page’s favicon. Now you can visit other websites in the browser, while still being informed about news on your project at CuePin. Your designs and documents are presented very generously, and obviously, they are the main focus. For detailed outlines, there’s the option to zoom in using a virtual magnifiying glass. CuePin allows for the display of items in maximum size. Then, your designs will fill the entire browser window. Those that use CuePin to work on multiple projects at once will also like the Approve feature. This lets you mark all finished projects. An accordingly concise notification will tell all other team members that the project is completed. Now, you and all others will always stay on track as to which projects are closed, as well as which ones are still being worked on. 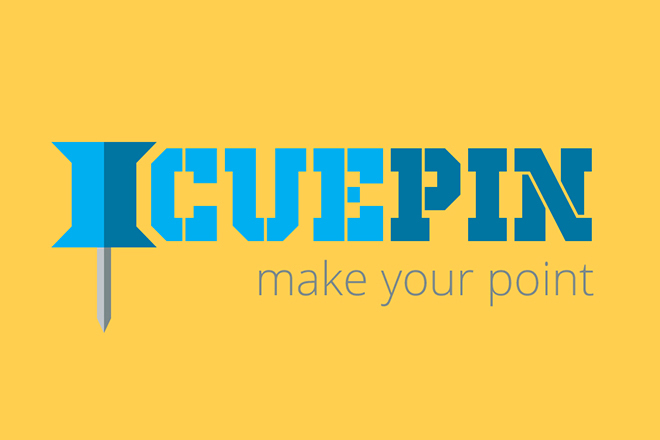 A free 30-day trial of the full version of CuePin is available. That means that you get to send out invitations, and work with others on a project. However, for long-term work with the service, it is required to book a paid plan. The plans and prices are very clear. There are three plans which allow you to set up five, 20, or 50 projects, respectively. The costs are either ten, 30, or 60 Dollars a month, depending on the plan. The amount of team members, as well as the amount of files that you can upload, is unlimited. As a paying subscriber of the service, you will also receive unlimited support via email. 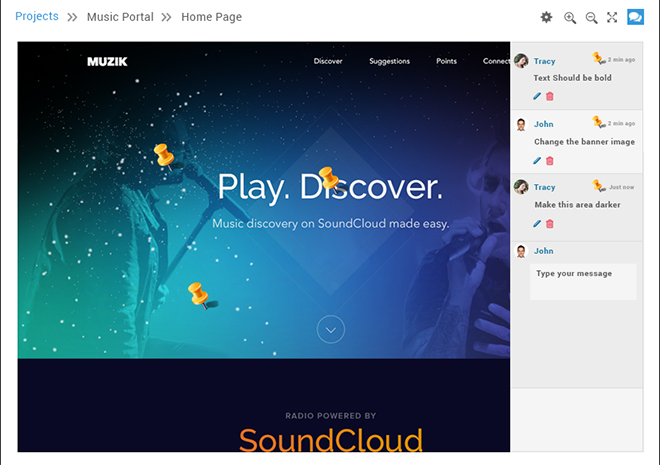 CuePin makes collaborative work a lot easier. If you have already tried to discuss designs or documents using a simple chat, you’ll know that this often takes longer than necessary, and leads to misunderstandings quite easily. The CuePin collaboration tool does a good job at combining options to present, versionize, and comment on drafts. The flexible price range attracts freelancers with a low amount of projects, as well as larger agencies.